This month we look at A Court of Thorns and Roses by Sarah J Maas. Following on from her wildly popular YA fantasy series Throne of Glass Sarah J Mass gives us another completely absorbing fantasy realm to fall in love with in A Court of Thorns and Roses. The first book in this series has been preceded with a lot of hype in the YA literary world, not surprising considering the popularity of her other historical fantasy series, and I have to say it completely lived up to that hype. Curious and intriguing characters, on-the-edge-of-your-seat action and gorgeous imagery combine to make this magical fairy fantasy one of my favourite reads of 2015. The book starts out with a dark Beauty and The Beast feel about it. Feyre (pronounced Fay-ruh) comes from a family that was once noble but is now impoverished. To survive and care for her family she hunts for game which is scarce in the harsh winter and so she must venture closer and closer to the fairy realm to find anything. One day she comes across a giant wolf that is about to poach her game and she shoots it, skinning the beast and taking the wolf’s lush coat to trade for coin. The wolf transpires to be a fairy in disguise and soon after another fierce beast comes to claim Feyre’s life for that of the fairy she murdered as per the treaty rules between the human world and the Fae world. However Feyre and the beast strike a deal where her life will be spared if she instead accompanies him to the Fairy realm to live out the rest of her days. Leaving the bleak frozen human world behind is no loss to Feyre and nor really is leaving her ungrateful family except for the small detail of making a death bed pact to her mother that she would care for her sisters. Be-spelled for the journey she awakens in the Spring Court and the shock discovery that the beast who took her is none other than the Spring Courts own King, Tamlin. Tamlin and his right hand fairy Lucian appear to be the only ones left in the Spring Court due to a curse that has diminished their kingdoms magic and for some weird reason left them all with permanent masquerade masques on. Yeah, I’ll concede that was a bit weird. As the story progresses it does become clear how the predicament came to be and while I understood the nefarious masques covering their faces was Maas’ attempt at getting the girl to fall in love with the Beast despite not knowing his real identity it felt a a bit contrived as a plot device to make the fairy hotties more mysterious and swoony. But swoony they were so I guess it worked. If I had one critique about this book it would be that it shows more than tells which can be a good thing if done well but in this genre of book where you are thrown into a whole new fantasy universe I think a reader needs a little more telling. The story soon loses its Beauty and the Beast twist, especially when it is revealed Feyre can’t read or write (A Belle that can’t read?!) and becomes its own unique story with fairy shenanigans, mythical beasts, rescue missions, dungeons, quests, evil queens and the steamiest of love interests. What I loved about this book was how flawed yet likable the characters were. They were complex and while they start out stereotypical ‘mean sisters’ ‘aloof, grumpy good King’ ‘dark menacing evil enforcer’ by the end of the book we are shown enough insights into these characters to understand who they are and why they are and even feel empathy for them. Feyre’s nasty sister and the evil Night Court Prince Rhysand were two of my favourite characters by the end of the book and I desperately hope they get their own chance to shine in a sequel. This gorgeous and effortless to read book kicks off a new series that is going to captivate you from the beginning until the end. This book will appeal to a broad range of readers but especially those who enjoy high fantasy and re-imagined fairytales. The book does lean toward the New Adult side of Young Adult literature due to the sexual content. Win your own copy of this book! 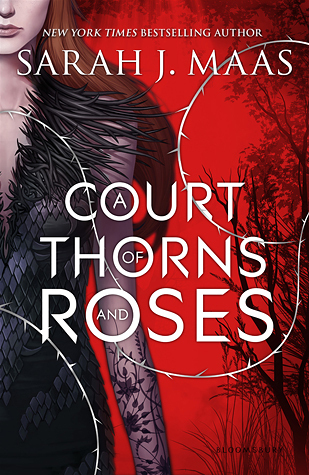 Send us in a book review of ANY book you’ve read recently, either email it to cteens@uhcc.govt.nz or post it a as comment to this book review ( you can log in using your facebook) during the month of July and you could win yourself your own copy of A Court of Thorns and Roses.